When I was younger and the internet was a smaller place than it is today, one early hobby was browsing newsgroups searching fir Disney theme park audio. Most often scratchy things in a time when internet connections were still slow enough to make RealAudio an attractive possibility, there was nothing like spending the better part of a day trying to get one file, opening it up, and hearing something totally new to you. 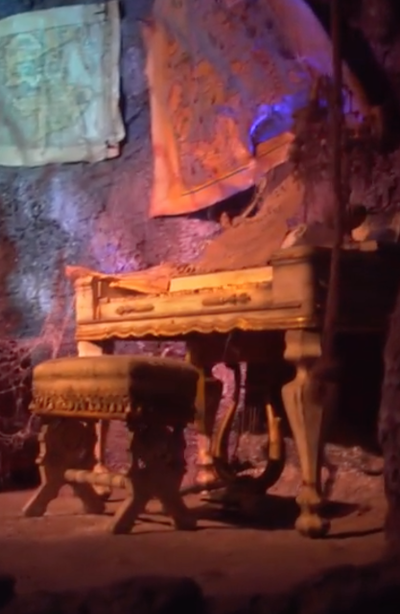 I heard Phantom Manor's soundtrack almost 20 years before I got to ride it, and I was listening to the Pirates of the Caribbean "Scare Me Music" long before I got to Disneyland in person. The sounds of the park, the musical soundtrack you could take home, were an early obsession - one that's played out on this blog before. But one early annoyance that's never fully gone away was: where are all of the Walt Disney World sounds? Disneyland music is everywhere - how many remixes of the Haunted Mansion do we really need, after all - but in the few cases where I could find music from Magic Kingdom, it often was either mislabeled Disneyland tracks, or versions from Disneyland often perfunctorily cut down and remixed. Where were the versions that tried to really capture the idiosyncrasies and unique flavors of each theme park? Well, as it turns out, I waited so long that I decided to do it myself. My initial attempt to preserve some of the unique atmosphere of Walt Disney World was posted in 2012, and its superior followup in 2014. But the project never really ended: much of the work I did on the Musical Souvenir between July 2011 and December 2014 was intended to lay the groundwork for more expanded audio mixes. Only a few of these bucket list items were feasible; I've still very proud of the restoration work I did on the 1984 version of Space Mountain, and the full Jungle Cruise soundtrack included in the second collection. But one item still bothered me, because I was so close to having a finished version: where was the complete Pirates of the Caribbean soundtrack for Magic Kingdom? In theory, this was not an impossible goal. Very little in the Florida attraction was not simply taken from the recording sessions for the original ride. My Caribbean Plaza track from the second release of the music project had the start and the end of the attraction - the unique pieces - but the whole stretch of the attraction in the middle had to be resolved. How do you decide to cut down all of that material? If you listen to the majority of audio mixes of Pirates of the Caribbean available online, you don't. The standard, agreed upon method is to play each and every track back to back. I've never liked this, because although it does allow you to hear everything, it also means that areas with a lot of overlapping, interlocking music cues, like the Haunted Mansion graveyard or the Burning City, go on for 6, 8, 10 minutes. What I like to do is to give as nearly as possible an approximation not of what was recorded, but of what you hear and experience when you are there, on the ride. This means letting the cues all bleed together, but also allowing moments where you can artistically stretch or compress other areas. It also means that I do want to hear incidental sounds in so far as they add to the experience - for the same reason that my reconstruction of If You Had Wings from 2011 didn't sound right until I added a lot of clattering 16mm projector sounds buried underneath the music. In the end, I tackled Disneyland's Pirates of the Caribbean first. There were two real goals here: first, to see how much I could extend the first third of the ride to really capture the atmosphere of that bayou and those caves, and to see how much I could tighten up the whole center section and keep it moving without losing the texture of the experience. I really admire how the Disneyland ride modulates its tones - going from the raucous burning city to the absolute quiet of the jail scene, for example - and I really wanted it capture that. I also decided it was worth including Old Bill, despite my goal to go back as near as possible to the original experience. 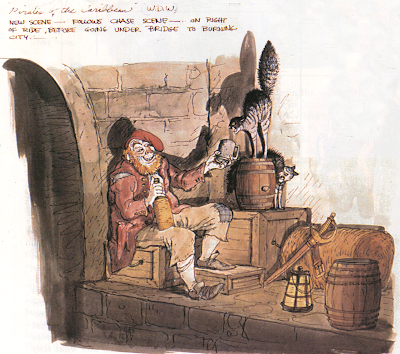 Old Bill was designed by Marc for inclusion in the Florida show, and brought back over to Disneyland at some point after that version opened. Like the "bayou old man", himself a copy of Beacon Joe designed for Magic Kingdom, he's been there for so long that he may as well always been present. In Marc's own handwriting, no less. It all worked very well, especially the haunted grotto - aided and abetted by the dozens of live waterfall recordings I made to construct the Musical Souvenir. However, a hard drive crash meant that I lost a number of the sound files and was left with just the rough export version presented here, which is why there's a few render errors. And that was that - for a few years at least. The real thing holding me back from making the attempt was the complete unavailability of the Talking Skull safety announcement from the original version of the attraction. I never really liked the Magic Kingdom Talking Skull - his announcement was kind of lame and more often than not you could barely hear him under all of the howling wind and thunder in those much smaller caverns. I liked him even less after I saw the iconic Disneyland version. But he was an important part of the uniqueness of the Florida ride, and without him I saw no advantage in expanding on what I had already done in 2014. Then something unexpected happened. 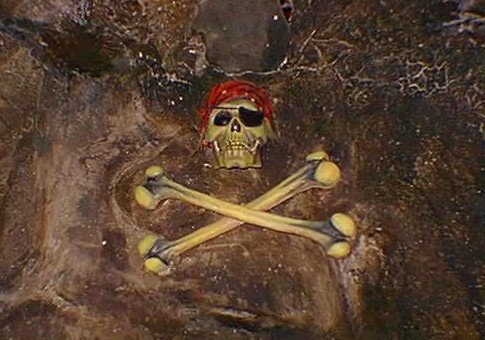 Magic Kingdom went and put a talking skull back in the ride. A different one, to be sure. But that got me thinking about the original 1973 talking skull - and whether I should try again to find a usable live recording. It's a total crap shoot whether or not you'll luck into one - it's all up to a kind of camera used to capture the footage, how loud people on the ride with the videographer are, how loud the attraction was that month, and more. It's bad enough considering it with today's modern cameras, but if you consider finding just the right one based on what came were available prior to 2006, you see how unlikely this is. I went looking anyway, searching backwards chronologically, until I hit 2003 - and a likely candidate, uploaded by "JPL1311". It was clean, mostly clear, and the Talking Skull was really loud. Once I stripped away the audio hiss using digital filters, I had something that sounded pretty close to a source audio mix. I figured it was worth a shot. So I went back into my files and pulled out the Caribbean Plaza track from 2014 and Disneyland Pirates track from 2015 and was able to combine them into something pretty darn convincing. As far as I know it is the first complete attraction soundtrack for the Florida Pirates of the Caribbean ever created. It was pretty interesting deciding where this track needed to vary meaningfully from the Disneyland track to get the desired effect across. What I can say is that the 1973 show has a much more complex soundscape from the Disneyland original - there's nearly no moments of quiet. I had to layer audio tracks much more aggressively in the haunted cavern to get the menacing atmosphere Marc Davis intended. And, of course, the whole thing ended up being a few seconds longer than the Disneyland mix - even if you don't actually get to the ride itself until nearly halfway through! But more than anything, it's just satisfying to hear, and to have. I try hard to really transport listeners in my tracks, and this one really takes me back to the Pirates of the Caribbean I knew as a kid. This version of the ride was also my preferred attraction to work back at the start of what passed for my career at Disney, so it's a cherished memory for me, and one I fought to preserve while I worked there. The talking skull may have returned, and the parrot may no longer be out front and the cannons on the roof don't fire, but at least we have this - I think it's almost as good as being there again. Ye come seeking adventure and salty old pirates, eh? This be the place - check out the Pirates of the Caribbean Hub Page for more goodness about this classic ride. Or hop a monorail over to our Theme Park Music resource for even more vintage Disneyland and Magic Kingdom music! Wow, what a post! I'm strictly Disney, so I skip your other posts about other parks, and your posts about gaming, but this post is why I come here. Your dedication and attention to detail is simply astonishing. Thanks for this. I love this website and your dedication to Disney history. I especially get excited when I see a new post having to do with old park audio like with your Musical Souvenir of WDW, etc. Appreciate the time you put in on this and can't wait for more!! Bravo! Ah, those cannons! Thank you for sharing this! So how do you feel about Disney enacting ANOTHER change to Pirates of the Caribbean because of political correctness and this time to one of the most iconic moments of the ride? I mean a Pirates of the Caribbean without "We want the redhead! Wen want the redhead!"? It's simply staggering. I know I'm mad as hell. I can't wait to listen! How does your Pirates work compare to the recording on "A Musical History of Disneyland: 50th Anniversary?" This is awesome. I can't wait to check out the tracks! Despite the official attraction release (which is great), there's still a lot more that's missing. This is really impressive! I love both soundtracks, and I love it when you post about park history and rare stuff like this. I totally understand what you mean about WDW vs. Disneyland soundtrack availability too. I blog about the Tower of Terror, and while I've found almost all of the source audio for Disneyland's now-extinct Tower, I've found almost nothing for the original Florida version, which is really frustrating. This was fascinating to read about; I've still never been to Florida, but the similarities and (especially) the differences fascinate me. Thank you for all of your knowledge and effort so that we can all enjoy this great reconstructed track. Amazing! Man, that brings back memories! The ride has become such a Frankenstein hodgepodge of different ideas and styles that I cherish anything that preserves how it felt as a cohesive experience. This is amazing. I've spent years trying to do this myself. I couldn't have done a better job. Your blog is wonderful as are you. I'm so appreciative of all the work you put in on this blog. Thanks as well for the video game posts - it was nice to revisit those gaming memories.